Mugsy's Rap Sheet » Where Have All the Republicans Gone? I first noticed it right after the 2006 Mid-term election when Republicans lost control of both the House & The Senate after near unbroken control by the GOP since Newt Gingrich’s infamous “Republican Revolution” in 1994. Suddenly, no one (that I *personally* came in contact with) was willing to admit to being a “Republican”. It’s like they vanished from polite society overnight. Ever since then, if you “accused” a clearly partisan Conservative hack of being a “Republican”, they would (and still do) get very upset and DENY they are a “Republican”. They’re all “Independents” now (and with the rise of Ron Paul, the label “Libertarian” is now popular). But don’t dare call them a “Republican”! The only thing worse would be to call them a “Lib’rul”. The reason I’m telling you all this is because I’ve just finished yet another week of “debates” on YouTube with two retarded Conservative “Bush-apologists”… a term I use deliberately to annoy them because: 1) they always deny being Republicans or liking Bush at all despite their fierce support of him, and 2) Because “it’s not an apology if you don’t think Bush did anything wrong”, and they don’t. In their world, Saddam had WMD’s (and we found them! ), America was never attacked, Bush laid the groundwork (in 2002) that eventually got bin Laden NINE years later (when he said he “wasn’t concerned about him”? That was a ruse), and the economy didn’t fall apart until after a completely happy and satisfied electorate suddenly decided to up and change control of both houses of Congress on a whim in 2006. And, of course, both denied being “Bush-apologists” or “Republicans” at all. In 2007, it didn’t take me long to figure out why obvious “Republicans” were suddenly unwilling to admit they were “Republicans”: George Bush. After Bush left office, I started receiving an an actual explanation from obvious Republicans why they didn’t like being called “Republicans”. The answer was always the same: “George Bush wasn’t a (true) Conservative!” (the “true” appears to be optional. The equivalency of “Conservative” with “Republican” appears to be not). And just “why” wasn’t Bush a “true Conservative”? Because he doubled the National Debt and “spent like a Democrat!” Of course, the last Democratic president balanced the Budget and left a surplus (to which they credit the Republican Congress… the same Republican Congress that “left Bush a Recession” and was in control the first six years of the Bush presidency.) Bush was a tax-cutting, deregulatin’ fool. That’s what “Republicans” do. The results might not of been what “Conservatives” think was supposed to happen when you do all that, but just because the economy imploded as a RESULT of Conservative policies, doesn’t mean “Bush wasn’t a Republican”. Nor does it mean THEY are not “Republicans” either. Today, I’m a Democrat. I’m a LIBERAL Democrat. I do NOT call myself “Progressive”. I hate the word. I think some Liberals call themselves “Progressive” because they’ve allowed Republicans to redefine the word “Liberal” to mean something bad. No. Sorry. It’s MY word and I’m not giving it up without a fight. “Liberal” is not a bad word. It means “generous” and “open-minded”, and I REFUSE to allow the other side turn it into something to be ashamed of. You see, I’m an adult. I can disagree with my Party and still call myself “a Democrat”. 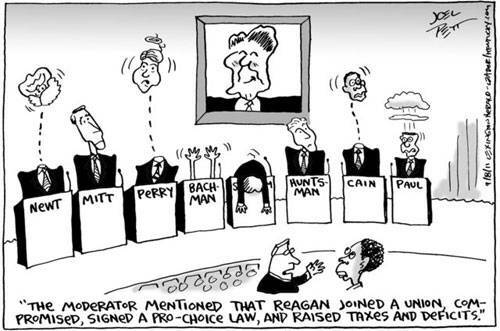 In Republican Land, if a person disagrees with their Party on anything, they think that makes them an “independent”. I’ve yet to meet an “independent” that wasn’t really just a disaffected/disappointed Republican. Republicans comes in two forms: the seriously misinformed (that never question what they are told because it confirms what they already believe or want to believe… like Obama is a secret Muslim with a fraudulent birth certificate), and the deliberate misinformers that know what they are saying is a lie, but say it anyway to advance their personal agenda. By 1996, Bill Clinton made me “a Democrat”. No longer calling myself a “Republican” or “Independent”, my “come-to-Jesus” moment was the ceaseless parade of investigations into Bill Clinton by the GOP for no discernible reason other than simply because he was a “Democrat”. He turned around the economy, gave us The Internet, and was doing a great job, yet they acted like he was the Devil himself, spending millions to dig into his private life. Every week it seemed like there was another “Gate”: “Mail-Gate”, “File-gate”, “Trooper-Gate”, “Whitewater-Gate”… I guess I have Newt Gingrich to thank for helping me realize I was really a Democrat, not a “moderate Republican”. But it took George W. Bush to make a “Liberal”, and for that, I will always be grateful. Please REGISTER to post COMMENTS and be notified by e-mail every time this Blog is updated! Firefox/IE7+ users can use RSS for a browser link that lists the latest posts!